Researchers often find themselves trying to explain their fields to non-technical audiences. Working in human genetics as I do, I’ve found that the average lay person has many preconceived notions about heredity and genetics. Some of them have a basis in truth, but many are inaccurate, if not altogether wrong. These misconceptions are often perpetrated, surprisingly, by our educational systems in their attempts to simplify a field that’s anything but simple. As usual, the media doesn’t help either. They don’t like “it’s complicated” answers. The idea that eye color is a simple trait and blue eyes are recessive is one of the oldest human genetics myths. It’s kind of true, in that blue-eyed couples tend to have blue-eyed children, but it’s not entirely true. Recent genetic association studies identified variants in a locus on chromosome 15 (specifically, in the adjacent genes HERC2 and OCA2) that are major determinants of eye color, but the trait is influenced by interaction among at least ten different genes. This is further complicated by the fact that eye color can change, especially in the first few months of life. 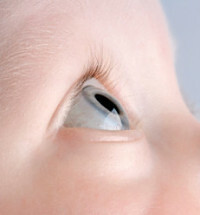 Many infants are born with blue eyes that become brown or green. I understand the need for real-life examples when teaching subjects like genetics, especially to children. Illustrating genetics with tongue-rolling or a hitchhiker’s thumb as simple inherited traits makes the lessons more interesting and memorable. Realistically, however, those of us who work in genetics understand that things are rarely as simple or straightforward. There’s an excellent website on the Myths of Human Genetics maintained by John H. McDonald of the University of Delaware. He debunks many of the common examples of hereditary traits and discusses some good reasons why we shouldn’t be teaching them. It remains the best predictor of “cerebral lateralization”, in other words, which side of the brain you use (for language). Left handedness can be advantageous for some sports, notably boxing, baseball, and racket sports. Left handedness can be disadvantageous when it comes to writing with pens, (smudges), finding scissors, opening doors, etc. There’s a cultural effect: the stigma of being left-handed. In 1900, only 2% of adults wrote with their left hand (now it’s 10-15%). My own grandmother, a lefty, was forced to learn to write with her opposite hand by the nuns of her Catholic school. Handedness tends to run in families, but it’s a complex trait: a substantial genetic component but numerous environmental influences. A recent study of 25,000 twin families found that additive genetic effects account for 25% of variance, with the rest due to environmental factors. In other words, if two left-handed parents have a child, there’s only a one in four chance that the baby will be left-handed. If the knowledge we’ve accumulated over the past century (or even the past decade) has taught us anything, it’s that there are few absolute truths when it comes to human genetics. Sure, there are disease genes, but there are also modifiers of disease genes, and modifiers of modifiers of disease genes. Incomplete penetrance, genetic heterogeneity, pleiotropy, and gene-environment interactions are just some of the factors that make even studies of relatively simple genetic diseases challenging. If anything, the concepts of genetics are becoming harder to explain. We will need the help of educators (for students) and genetic counselors (for patients and families) to do it well. As the story of human genetics continues to unfold, I think that a future like GATTACA (a sci-fi movie in which an individual’s entire potential is “read” from his or her genetic code at birth) is unlikely. There are limits to the predictive power of genetics, and many of the important factors for disease risk, such as diet and environment, can’t easily be quantified. That said, it is still clear that many of the genes contributing to human disease — especially common conditions like heart disease, diabetes, Alzheimer’s, and cancer — remain to be discovered. Identifying these, and quantifying their effects on disease risk, should lead to diagnostic and therapeutic approaches for improving human health.